For those of you that have an iProduct there is a very handy little app that provides all your list building functionality for a minimal cost. Over the past 3-4 years I've been waiting for Lone Wolf Development to put Army Builder on the iPad. Although there have been numerous promises over that time it has never eventuated. Now it may be that they needn't bother. 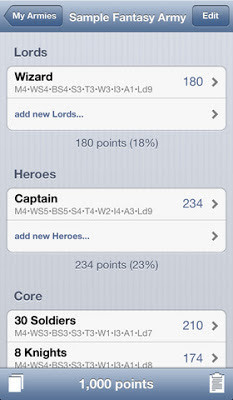 Sean Rogers has completed and refined the Quartermaster app to a point whereby it does most of the list building functionality required for WHFB and 40k. 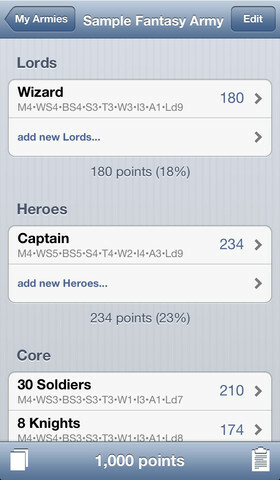 His app is a framework which allows you to download and utilise fan-built templates for the armies in both those games. The key to this product (and the reason that it doesn't infringe IP) is that game-specific content is provided by users at no-cost. This is a similar model to Army Builder. Where this appears to score above AB is with the speed that new content comes to market. The High Elf template was up within 2-3 days of book release in time for users to start constructing lists. Generally with AB there is a one month period before new content is uploaded. The templates for various armies can be accessed here at no cost. So where does this set vis a vis Army Builder? Apple only? I'm not sure if there is an Android version? Overall I am very very happy with the app and think that it is almost a must-have if you have an Apple product - especially as it costs no more than a large trim soy moccachino with a twist of lemon. I have been using this product for about 8 months now and its great. I have since let my Army Builder subscription expire. Its very good for emailing lists to people, with 4 clicks of buttons its gone. BattleScribe is the app I use on Android, and it looks as though they have just released an iOS version as well. It has data file repositories built in and updates the data files automatically. It's also free. Just looking at their website, they also have PC/Mac versions too. Maybe a possible alternative to Army Builder? I've started using this as well and agree it's awesome once you get the templates up and going. I've been using this since I got back into whfb excellent app design. Design lists at work on i5 and iPad I yake to tournies. The latest update to show magic item notes you have put in is cool. 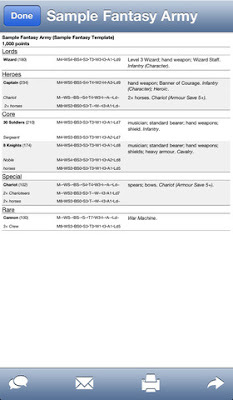 I was using battlescribe for 40k lists previously. Good little app. For fantasy I've reverted back to excel spreadsheets and pen and paper. I'm a bit archaic like that! That said this looks like a good like program for the job. I found this quite interesting and even easy to use, one place where I felt this application to be incomplete is, it doesn't allow to enter magic items. In future, I am sure they will be looking forward to this to make this application look complete. I have been using this app since I got back into the game a few months ago, and can only describe it as awesome. The author has however already had GW's lawyers breathing down his neck, and when I wrote to ask him why there was no explanation of Army Special Rules or Magic Items in the templates, he replied by saying that "it would make the army books obsolete and that players must still buy the army books".